This is the online documentation of ExeOutput for PHP. 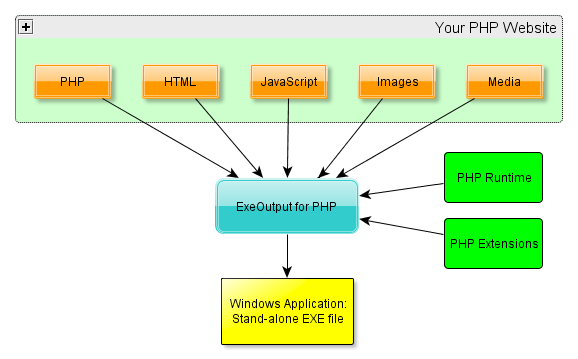 ExeOutput for PHP™ is a software that lets you create Windows desktop and console applications from PHP scripts and websites. The executable is stand-alone: the PHP runtime is embedded inside the EXE and is never unpacked to the hard disk. You can choose the version of PHP you want to execute: from PHP 5.6 to PHP 7.3. PHP scripts are never unpacked to the hard disk and executed directly in memory. Console (no GUI) and command-line only applications can be built from PHP scripts (PHP to EXE). PHP will work in PHP CLI mode. Applications are rendered either with the Chromium Embedded Framework (CEF) v3 engine. No third-party software is needed: the applications you build are stand-alone. 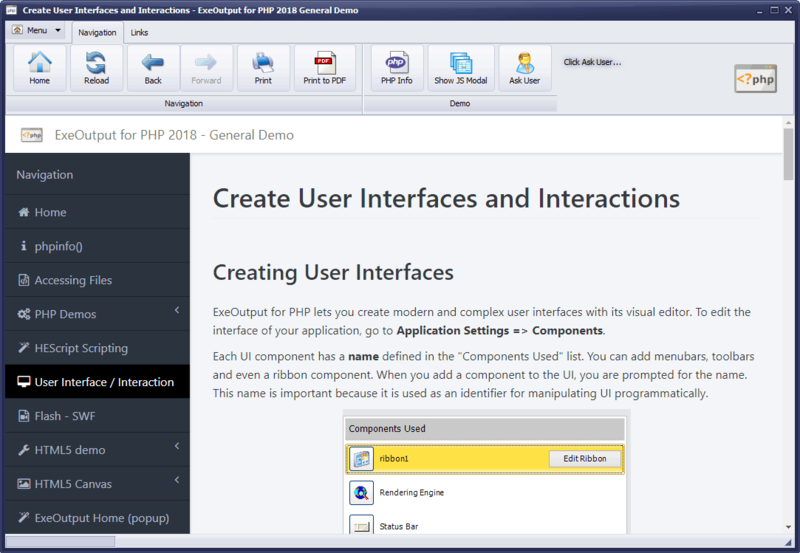 Basic PHP extensions are supported and may be embedded inside the EXE too. Database engines such as SQLite are successfully handled by the PHP engine. You may also have your applications connect to remote database servers such as MySQL. PHP pages and websites are displayed in a custom secure web browser. Standard navigation tools and menu commands are available, and can be customized according to your needs. You can design unique GUIs for your applications: skins, ribbons, toolbars (custom buttons), menubars, tray icons, alpha-blended splash screens (32-bit PNG) and much more. Use existing PHP functions and extensions in your applications: cURL, graphics, XML, PDF, Zip, databases, and much more. AJAX and jQuery are supported. HTML5 and CSS3 are supported. Debug tools: CEF Developer tools and XDebug are available. Open audio and video formats, WebRTC are supported. Support for high DPI and 4k screens, multi-monitor displays. No server is required! No port and firewall conflicts. Can include a portable MySQL server (MariaDB) with your PHP application and start/stop it automatically when your application is started/stopped. EXE customization is allowed with your own icon, version info. Applications can be digitally signed with a code signing certificate (SHA256 and Authenticode) to avoid the security warning displayed by Windows 10 and lower editions. Portable applications can be created. Full Unicode support (for the application only: PHP is not Unicode compatible). Support for various PHP frameworks. Settings are saved in projects and managed with a GUI featuring a Windows Ribbon style interface. Compatible with Windows 10 and previous Windows versions. Browse through the different topics with the help contents tree on the left side to discover ExeOutput for PHP’s features. Press F1 in the software program, it will open for you the topic related to the current page. Use the documentation’s search engine to find out a specific issue. If you have questions, feedback or bugs to report, you can visit our forum at https://www.gdgsoft.info or contact us by e-mail: [email protected].